Thanks to all of you who have attending our EdTech Leadership Meetings throughout the year(s). Your dedication and expertise are so very much appreciated! I hope your summer is filled with exciting adventures! (also June 9th at Valley Region EL #6, Panorama City or June 15th at Peary Delta Center in Gardena). Please visit the website for directions on registering for this workshop. Join us for the final UserGroup meeting of the year. Learn some great tips on using the SMARTBoard in the classroom. If you are planning on attending, please let me know. Our seminar host is Michael Wells, Director of Technology for Vallecitos Union School District. He will describe a variety of factors that have made the iPad program a powerful way to use Apple’s innovative technology to transform teaching and learning. Understand how iPad devices are providing rich, interactive content - apps, books, internet browsing, video and media tools. Hear techniques and tools for managing iPad content. Learn from an early adopter how the iPad is redefining teaching and learning through a personalized, highly engaging approach for students and teachers alike! Participate in a live chat for Q&A. Click on the registration link to reserve your space! Come join us for the first ever iFest, a conference on Mobile/Tablet Technologies. If you have an iPhone, iPad, iPod Touch or a droid, join us for a day of learning. These mighty devices are changing the world! Let's figure out how to make them work for education. We will have sessions about personal use, best classroom practices, how to set up sets of iDevices, ePublishing, Classroom Responders and lots more. Click HERE to register. I hope to see you there. It's going to be fun! Thanks to our gracious hosts at the Los Angeles Office County of Education, we are able to offer this free two day seminar. Please send this opportunity out to your intermediate/ advanced teachers. Space is limited to 100 spots. Enhance your ability to create professional and interactive SMART Notebook lesson activities. During this seminar you will learn tips and tricks for using SMART Notebook software’s interactive tools and Lesson Activity Toolkit. You will create lessons that can be shared with educators and uploaded to the SMART Exchange. SMART’s experts will be on hand throughout the seminar to guide and assist in your lesson creation. You must bring a laptop to create lessons. No laptops will be provided onsite. We also encourage you to bring any curriculum materials you might need, such as teacher guides and supplemental materials. The seminar is open to intermediate and advanced SMART users. Complete the application by Tuesday, July 5, 2011. Applicants will be notified of their acceptance by Tuesday, July 12, 2011. Participation in both days of the seminar is required. Lunch and parking will be provided. Dress code is casual. This post really gets at what Twitter is all about, and why it can empower teachers with collaborative learning opportunities for themselves, like no other tool. Click on some of links to see the wealth of information you can find in just one day! A Google a Day - One new question is asked a day. Search the web to find the answer, then submit. A great tool for all learners! Google Scribe - This site uses predictive text to help writers complete words and phrases. An excellent classroom tool! This resource helps you to become an expert in Google Apps for Education. (Our student MyMail system is a Google Apps for Education program.) The Google Apps Training Program consists of online curriculum, qualification exams, and certified trainer status. Study the curriculum, pass the exams, then apply to become a Google Certified Trainer! Even if you don't desire to become a Google Certified Trainer, the curriculum on this site is excellent for anyone who would like to learn more about this powerful suite of tools that you can use in your classroom. InfoGraphics as Creative Assessments by Kathy Schrock This site is a rich resource for learning how to use Infographics as creativity tools and assessment tools in the classroom. The third annual Horizon Report K-12 is now online. 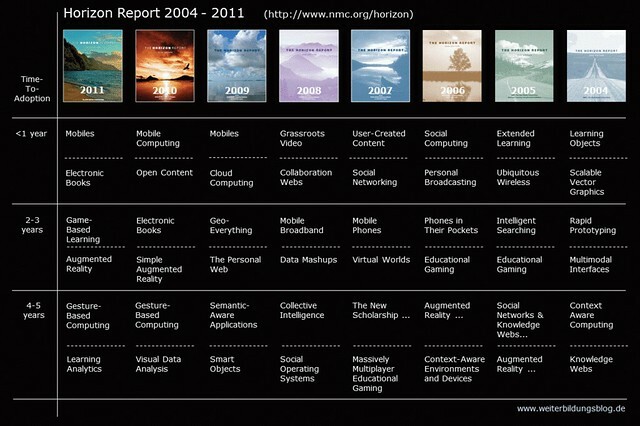 This report predicts the trends in educational technology and how those might affect the classroom. The major trend to watch in the near future is: MOBILE TECHNOLOGIES. How will we use these in the classroom? How can we best engage the learner? These are questions that need to be addressed. This article by Daniel Donahoo explains it well. Join us this Thursday for our May SMARTBoard Users Group. Educators support each other as they are learning to use the SMARTBoard in the classroom. Please share this with colleagues at your school. Please download the flyer for distribution. Our last EdTech Leadership meeting of the year will take place next Thursday, May 19th. Bring your favorite application and strategies to share. I'll be sharing what I know about "the cloud" and storage solutions. Come join us as we learn from one another. Thanks to Carlos Gómez and Andrea Johnson, principal, at San Miguel Ave. Elementary for allowing us to meet at their school. LAUSD and iPad Best Practices Workshops throughout the district! But how do you manage and deploy these apps? What about configuring a classroom set of Apple mobile devices to use your LAUSD wireless network? What about getting a volume discount on purchasing apps? Join Apple Education Sr. Systems Engineer Dave Douglas for an in-depth look at planning and deploying and managing iOS devices on your LAUSD campus or department. Workshops are from 3:30 p.m. - 5:00 p.m.
To fully benefit from this session, it is strongly recommended that you bring an iPad to use during the demonstration. Money Monday, filled with a wealth of grant resources, is published regularly on LACOE's Instructional Technology Outreach site. Access the latest edition by visiting http://moodle.ito.lacoe.edu/consortia/ Click on LAUSD and login with guest as both the username and password. How are educators using pocket video cameras in the classroom? Common Sense Media recently published an article on digital citizenship called, How Rude! Manners for the Digital Age While the target audience is parents, there are useful tips for educators to share with students as well. ScoopIt allows you to create an attractive online display of web resources (like the InfoTech publication). Add news and RSS feeds and easily allow this tool to capture and curate resources that can then be used for research. This would be a great tools for students to use to gather resources from social media and news resources. I've recently updated my iPad site at http://ipadsinschools.weebly.com I've also been bookmarking some amazing iPad resources lately. Check them out at http://www.delicious.com/janstearns/ipad You can sort the iPad resources by adding tags like "apps", article, or research. Please join us for LAUSD's InfoTech 2011 at the Los Angeles Convention Center on Saturday, April 30th, from 9-1. There are many wonderful student presentations and teachers who are ready to share best practices with you. It's the best way to learn new ways to use technology in the classroom, by learning from others. Parking is free. Please see http://infotech.lausd.net for more information. Video Conferencing Made Easy - Free! What is the Great American Teach-In? A day to remind ourselves and our students that citizenship means asking questions, finding answers and standing up for what you believe in... and that education must mean that too. Every classroom, every student, every school... draft a declaration of educational rights. Join students and educators everywhere to post your declaration of rights in education. The site has resources like essential questions with prompts, plans, and icebreakers. Join and let your student voices be heard! - No installation required! Just plug in and use! Diagnose areas of potential reading difficulty and support beginning readers with Reading Remedies! Quick and easy assessments you can conduct in each of six areas of literacy: rhyming, blending, segmentation, fluency, and word attack. Suggested follow-up activities to teach specific skills in each area as well as complete lists of sight words, common prefixes, suffixes, and vowel combinations are included. Record, playback, and save one minute fluency readings. This tool can really help students boost their fluency levels. Studies have shown that this type of process can boost fluency levels significantly. This is a great tool for the busy teacher who wants students to get that extra support that digital tools can offer. CoSketch - This collaborative tool allows learners to work together on a whiteboard-like environment. Background images can be uploaded for annotation. It also has support for using Google Maps as a background. Work can be shared by weblink or can be embedded elsewhere. The best part? It's free! How are we changing the learning environments in our schools to include these types of tools? How about you?